If you yearn to expand your horizons and get in touch with your inner self through nature, adventure, leisure and culture, then South Africa should be at the top of your bucket list. A world of experiences in one magnificent country, this vibrant melting pot at the southern tip of the African continent will satisfy all your desires... and deliver even more than you could imagine. For hundreds of years people have travelled to this natural wonderland in search of thrills and opportunity. A stimulating, abundant place full of unexpected delights and unique discoveries, South Africa offers something for everyone: from the young, to the young at heart, from pure pleasure seekers, to adrenaline junkies. Well-known around the world for its historical and political legacy of reconciliation after apartheid, the country's nickname of the 'Rainbow Nation' is well deserved. The South African experience makes for a heady mix, with influences ranging from Africa, Europe and the East. Its rich cultural make-up is set against the inspiring backdrop of its freedom struggle, and is infused with a spirit of 'Ubuntu', an ancient African word meaning 'human kindness', personified by national heroes such as the beloved Nelson Mandela. This spirit is reflected in South Africa's friendly, resourceful people, who will welcome you in 11 different official languages and many more besides. Its dynamic, modern urban centres pulse with life and reflect a diverse blend of cultures and people from all over Africa, and further afield. 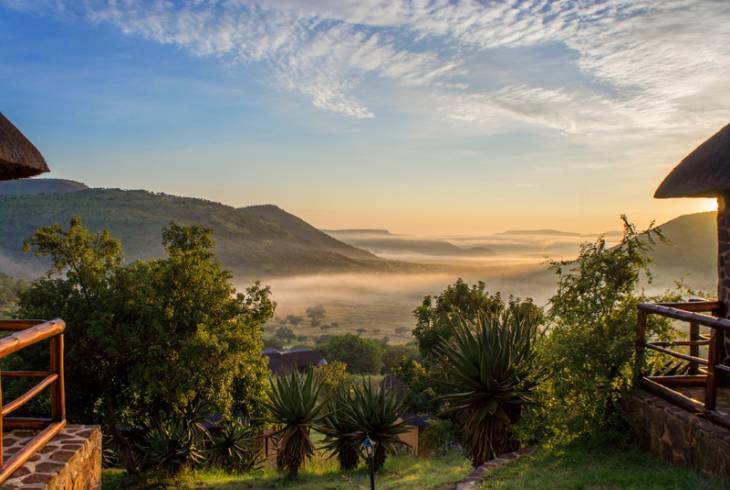 A proud custodian of no less than eight World Heritage sites such as the original, ancient birthplace of humans, the 'Cradle of Mankind' South Africa has also been declared one of the planet's 18 mega-diverse destinations. With its temperate, sunny climate, widely varying geography and moody vistas, South Africa is an outdoor lover's paradise. Wide-open savannah spaces become majestic mountain ranges. Arid deserts contrast with lush forests. Swimming-friendly beaches meet rugged shorelines. Oceans teeming with life vie for your attention alongside bushveld retreats boasting the Big Five... remember to pack your camera! South Africa offers it all: from eco-friendly wildlife safaris to international sporting events; luxury honeymoon getaways to high-level global summits. Here you'll find your niche, whether you're a history buff, or like to sunbathe in the buff! Shop until you drop, then savour a feast of fine food and wine, along with a wide variety of entertainment. Or enjoy more sensual pursuits instead: stargaze at Sutherland; white-water raft along the Orange River; or treat yourself to some relaxing spa downtime. South Africa is easy to reach, offering three international airports and once you're here, getting around, being comfortable and staying in touch with the world are no problem, thanks to its convenient, world-class infrastructure, accommodation and technology. No matter if you're a backpacker on a shoestring budget; a family looking for value for money; or a high-end globetrotter seeking indulgence, your choices are unlimited in this highly affordable travellers' playground. South Africa is a place that will speak to your soul. You'll want to return, because it will feel like home!